Ironically, today... (the day after I proclaim that I want to eat healthier) just happens to be National Potato Chip Day. 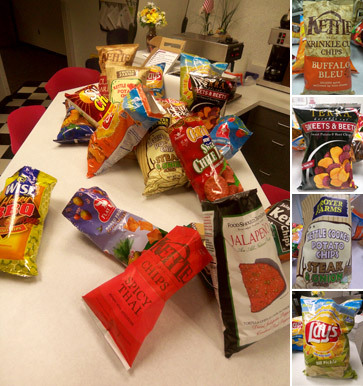 To celebrate, folks in my office brought bags of of different kinds of chips to share. Of course I had to sample as many as possible and now I have Captain Crunch mouth (another very healthy food). All the salty shards of deep fried potatoes have shredded the roof of my mouth and swollen my gums. Serves me right. Good thing it's just an American holiday. =P I *love* those Terra chips. Never seen the Sweet & Beet but had their mixed chips bag - trying to convince myself it's "healthy", haha. The Spicy Thai were quite nice and addictive. The Peach Mango were very weird, but in a good way. My fave is still Zapp's Cajun Crawtators. The Spicy Thai look interesting. Anyone bring in ketchup chips? Snyders of Berlin used to make awesome ones, but have since stopped. Herrs just aren't as good. What was your favorite chip? I looooves me Cape Cod Kettle Cooked chips. Mmmm. I like that much better than National Coffee Break Day. The spicey thai and the buffalo blue....my favorites! I've never had the nerve to try the spicy thai. Did you get a chance to try those? but the real question is, did you have pie on pi day? I guess I'm in the minority: I wasn't a fan of the Spicy Thai when hubby brought them home a few months ago. We didn't have pie either... maybe next year! No one brought in ketchup chips... we don't have as much variety in chips here in NYS as there is in PA where I grew up with all kinds of funky flavors. The Spicy Thai were not my favorite. They do taste very different though. My favorite was the Buffalo Bleu.